Organic Sales: Overall store sales are about 87% organic. Produce sales are about 97% organic. Local produce does not have to be certified organic if organic production and input standards are followed. Craig says that manufacturers and vendors do not see questions and concerns about GMO ingredients an unusual conversation any more. The store avoids products with suspect ingredients, and works with local vendors to remove them, when possible. Local livestock producers report that are having difficulty sourcing affordable non-GMO feed. The huge price difference between GMO-free feed and conventional feed keeps more growers from going GMO-free. The store also puts a lot of time and energy into customer GMO education. We help them understand that if it is organic, labeled GMO-free or certified with the NON GMO Certified Project then it is GMO free. We also help them understand which crops are the most often grown as GMO's. We are very honest with our customers and don't claim to be GMO free. We also encourage them to take action to require labeling. 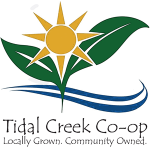 Tidal Creek Co-op is discontinuing products that are confirmed to contain GMOs, when alternatives can be found. When considering new products, the store gives preference to GMO-free products. The store also likes to give credit to manufacturers who transition to GMO-free, Kashi, for instance, by highlighting those products. Tidal Creek Co-op advocates for GMO labels so customers can make informed choices, and encourages its customers to do the same. Store personnel work to make sure customers understand that if a product is certified organic, labeled GMO-free or certified by the NON GMO Project then it is GMO-free. They also educate consumers about which crops are likely to be GMO. A participating Non GMO Project retailer, Tidal Creek does not claim to be GMO-free, but uses the project’s shelf tags and materials where appropriate. The store also uses a newsletter and flyers to educate consumers.